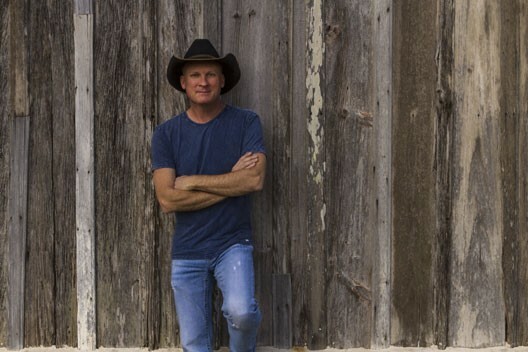 And anyone who’s ever been to a Kevin Fowler show knows he does far more than just talk the talk—the man delivers one of the most entertaining, high-energy performances you’re likely to see in country or any other genre, with a hard-ticket base that rivals many gold-selling artists. A blend of in-your-face rockin’ intensity, tongue-in-cheek humor and captivating country storytelling, Kevin’s music has his standing-room-only audiences hanging on every word . . . and singing right along with him. Whether it’s “Beer, Bait and Ammo,” “Cheaper to Keep Her,” “The Best Mistake I Ever Made,” “Don’t Touch My Willie” or any of the other unforgettable tunes that have seen him regularly perched atop the Texas music charts, Kevin’s music is the product of years spent perfecting his craft. And he’s not the only beneficiary. Other artists, like Montgomery Gentry (“Long Line of Losers”), Mark Chesnutt (“The Lord Loves a Drinkin’ Man”) and George Jones (dueting with Kevin on “Me and the Boys”), are among those who have recorded classic versions of Fowler songs. Response to the song about watching the words spoken when innocent ears may be around—or as Kevin describes it, shifting from “bus mouth” mode to “daddy” mode—has been excellent. And the tune, one of seven on the record produced by artist and frequent Fowler co-writer David Lee Murphy, is already making its mark on the charts. With his career track record, it would be easy to assume Kevin must’ve always known music would be his life’s passion. After all, how can you be this good at something and not have worked at it for a lifetime? But he admits coming to his career path later in the game than most. While Amarillo boy Kevin may not have had a clear vision of his life’s path prior to that momentous day, he shouldn’t have been surprised when he finally realized he was put on this earth to write songs and entertain people. After all, he’d been entertaining in one way or another since his attention-seeking days as a self-described “band geek,” playing drums in junior high and high school. But Kevin’s musical training had begun earlier when his mom, Shirley, insisted he take piano lessons, in spite of his hatred of it and his desire to play football instead. Looking back, he thinks his folks made the right call. “They were probably thinkin’ to themselves, ‘We’ve seen you play football—that’s no good!’” he laughs. Kevin recalls Amarillo as a good place to grow up, but entertainment options were, let’s say, limited. That meant 16-year-old Kevin and some buddies might sneak a 6-pack of beer on a Friday night, head down the road a few miles to tiny Vega—a town of under 1,000 people—find an old dirt road and “hide out.” Let the good times roll! The move to L.A. came after Kevin, then a junior at West Texas A&M in Canyon, saw that life-changing show at the Cotton Bowl. With 100 credits toward a business degree, he quit school and went to the coast to study at the G.I.T guitar institute. While there, he learned how incredibly competitive the music world really is. So, was he intimidated? Not long after his move to Austin, Kevin joined a band that became Rumble Train, but soon discovered he was the only with any motivation. Then he fell in with long-haired rockers Dangerous Toys (yep, short-haired, cowboy hat-wearing Kevin was in a hard rock band—there’s a rumor photos exist!). And, not surprisingly, they had a problem with Kevin’s tunes. “‘Man, these are redneck songs! We can’t play any of these.’” So, in a move that was more necessity than intention, Kevin began singing them himself. That ability has given Kevin more than a decade of success in his Texas stomping grounds where he is embraced with a vengeance by audiences who love him and his music. But he wants more. And, if anyone can do it, Kevin can . . . especially with his new batch of tunes, including the quintessential Fowleresque “Hell Yeah, I Like Beer,” “Beer Money” and “Chippin’ Away,” all the kind of clever party tunes Kevin’s built his career on. But the rowdy Texan reveals a very appealing tender side with the heartfelt “Do That With You Gone” and “Daddies and Daughters,” a song guaranteed to make even tough guy fathers of girls reach for a tissue. “Borderline Crazy,” a highlight on an album full of them, combines geography with a state of mind and adds just the right touch of Tex-Mex accordion, along with classic lines like goin’ to bed with my flip flops on. Who hasn’t been there? And Kevin perfectly describes every cowboy’s dream with “Girl in a Truck,” a song about a girl who, thankfully, is a “little naughty and a little nice.” “Here’s to Me and You” is an unabashed ode to Friday nights, “the girls all prettied up” and “guys with a couple hundred dollars burnin’ a hole in their blue jeans.” Does it get any better than that for a country boy? And “Big River” offers a different take on all things country . . . including the winding river whose “muddy waters wash my cares away.” Great lyrics full of powerful images. And one song they’ve been listening to and loving in Kevin’s live shows is “Knocked Up.” But what’s not to love about a song whose chorus includes the lines: “you got knocked up, I got locked up . . . I guess you’d say we both got screwed?” Yep, that ladies and gentlemen, is country music. With his new album, Kevin will have a larger megaphone than ever before, one that will not take him away from his country roots, but show the rest of the world what’s so special about them. Awesome! Only wish it had "Tequila" & "Now you're Talkin"
great songs! saw him last night with Willie, awesome show! Where is "All the Tequila in Tejuana"? The best show ever! Seen him 13 times in a year and never gets old. He is a great entertainer! His music gets better every day and is one of the best things about Texas! I have seen Kevin 3 times. once at Kingsland,Tx., Burnet, Iwas security for him there, and at the austin rodeo (2008). He has never been anything but the greatest!! He loves the stage but more,he gives to the fans.I could see him again and again.